Hockey is a game for everyone and we want you to tell us why that is true to YOU. Follow these three simple steps for your chance at $1000 in CCM Gear! 2. The essay is no longer than 250 words. 3. Submit your essay using the form below or mail it to the OMHA office at OMHA Essay Contest, 25 Brodie Drive, Unit 3, Richmond Hill, ON, L4B 3K7. 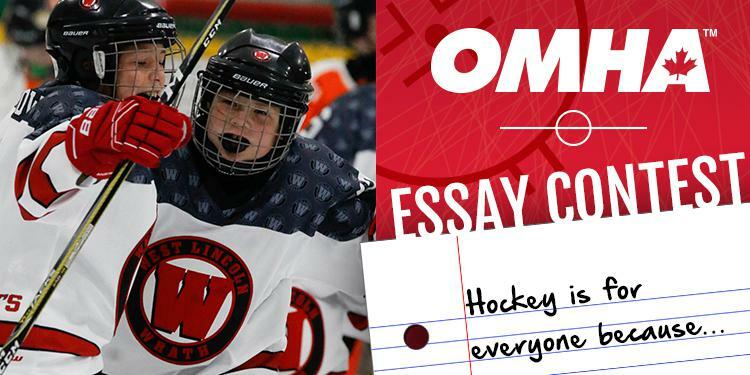 The fifth annual OMHA Essay Contest presented by Respect in Sport is designed for players to be engaged in an educational manner while encouraging them to express their thoughts on what life skills they learn from playing hockey. The top five essays will be selected by a committee based on the creativity demonstrated in their submission. All finalists will be awarded an OMHA prize pack while the grand prize winner will receive a $1,000 worth of CCM Gear. Submissions will be accepted until February 28, 2019.